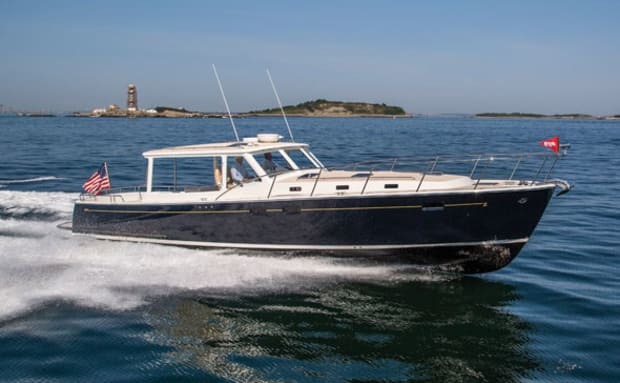 From start to finish, the MJM 50z was shaped by vast seagoing experience, and the only thing traditional about her is her looks. Inertia is a funny thing. You know when it grabs you by the lapels, like when you’re on a landing airplane and you feel the wheels touch and then the brakes grab and the reverse engines roar and you feel that lightness come over you? The flipside of that record is punchy acceleration, when you’re going at a good clip in a boat with a slippery running surface and some horsepower and the helmsman decides to punch it and the boat surges forward, seemingly out from under you. Thrilling stuff, considering it’s merely a body at motion tending to stay in motion. If you’re into physics, this is the boat for you, since she’s the brainchild, as all MJM yachts are, of an entirely different force of nature, Bob Johnstone of J/Boats sailing fame. Johnstone has always been about performance and getting the most out of every puff of wind on the racecourse. Well change that breeze to horsepower and you’ll have a more complete understanding of MJM. The high-tech lamination schedule (including E-glass, Corecell, and Kevlar composite) that’s employed by forward-thinking builder Boston Boat Works incorporates lightweight strength and stiffness from the word go, and it doesn’t end there. (Get the lowdown on the development and construction of the MJM 50z from “Designs on Greatness”.) And while it’s great to think about prepreg techniques and resin infusion and what it all gets you, it’s really better to feel what it gets you. 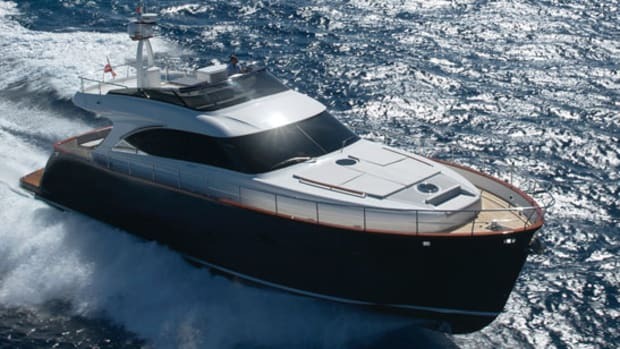 The solidity of this build and the speed at which we cruised away from the boat-show madness and into the calm of the keys is really the payoff. Taking the wheel along the way on our half-day delivery, I weaved through crab-pot buoys in the flat-calm conditions, enjoying the responsive steering and not needing to touch the throttles. After our sea-trial speed runs, during which a squall greeted us off Naples at the entrance to Gordon Pass off Keewaydin Island, I put her through a few sharp turns and manuevers and enjoyed the bite of that hull as she tracked through the curves without a suggestion of anything but complete control. 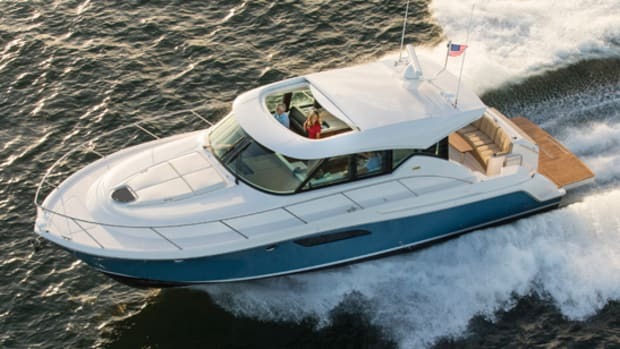 It’s good to know the rough-water capabilities are there, but this boat has the performance to slip through tight weather windows and outrun storms. She gives you range and speed in a combination that works quite nicely with the busy lives many of us lead today. 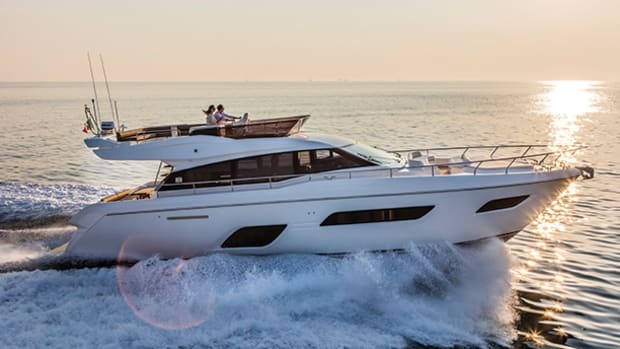 So while cruisers often arrive at their destinations at dusk or shorten their cruising legs to have time ashore in daylight, the MJM will let you pretty much pay a visit wherever you want, when you wish, and the fuel-for-fun transaction doesn’t seem to be a bad equation at all. 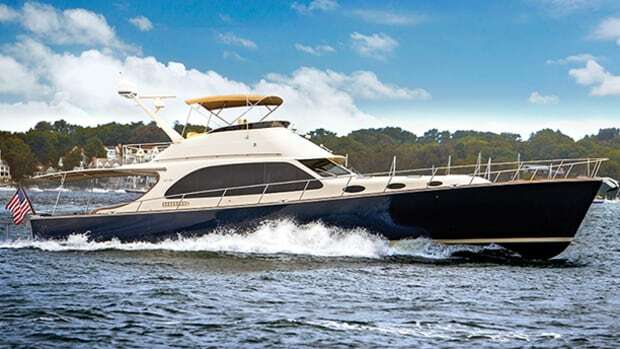 This boat is the largest MJM yet, coming on the heels of the 40z and the 36z (past models include the 34z and the 29z). 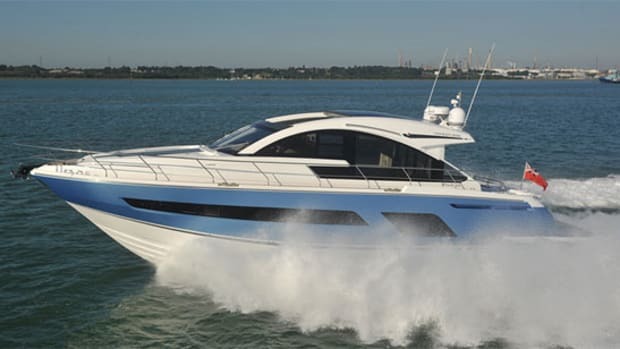 The 50z may be the largest boat the company ever builds but when you look at the spec list you realize what Johnstone is trying to do with his boats and each successive model. Johnstone learned long ago that the latest technology can allow him to get the combination of efficiency and capability he’s after. So on the boat we tested he incorporated three Volvo Penta IPS600s, and matches them to Volvo Penta’s interceptor-style tabs. 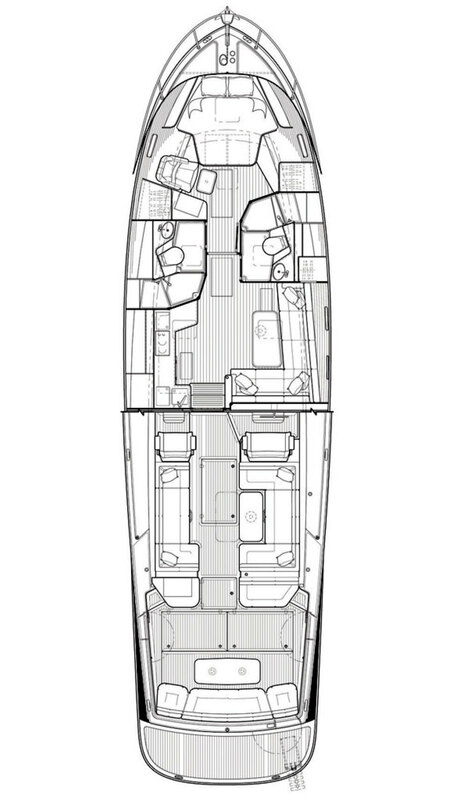 The engines’ low-profile allows the deck on the boat to stay at a manageable height, and, with the diesels positioned beneath the cockpit, the longitudinal center of gravity ends up where Johnstone wants it and the bridgedeck stays quieter. Under the hull, the triple IPS pods give you a draft of 3 feet 10 inches (the standard twins draw just 3 feet), and they also eliminate the need for a bow thruster. 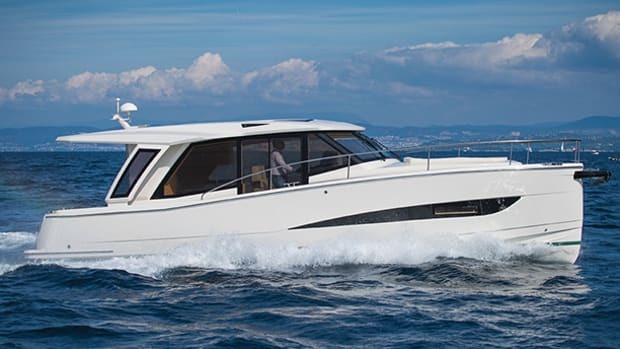 And Volvo Penta’s built-in dynamic positioning system gives the owner the freedom that Johnstone has stipulated as a core tenet of the design brief from the get-go: That either he or his wife, Mary, could operate the boat solo, comfortably. Speaking of comfort, there’s also a Seakeeper gyro stabilizer on board, positioned in a machinery space forward of the engine room. 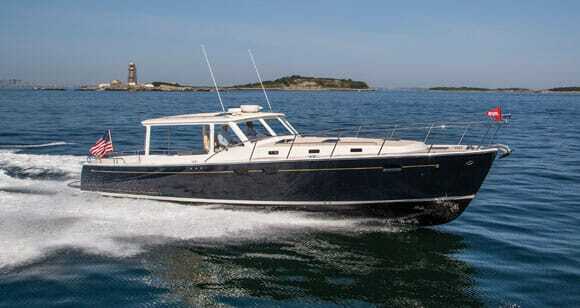 The MJM 50z offers the Seakeeper as standard equipment (not many other builders do that). Admittedly I thought it odd that a builder that’s so conscious of weight would include such an add-on—according to Seakeeper the unit weights 1,210 pounds in a bolt-on installation. When I asked Johnstone about it I got a direct line to his inner early-adopter. “The Seakeeper gyro stabilizer is like joystick docking was seven years ago … just getting started,” he says. “Over the next 5 years it will become a ‘must-have’ item and very important for resale.” It could be said the MJM 50z is built to reap the benefits of the gyro stabilization system, since her rigid, lightweight construction is sturdy enough both to withstand the forces exerted by the unit and to react to them quickly. And by making it standard, MJM gets better control over that center of gravity. The gyro didn’t get much of a workout, because conditions were so ideal. But we did activate and deactivate the system throughout our voyage. We didn’t shut it down, since it takes a while to spool up, but you can disable its function even if the gyro is spinning. But we wanted to test one theory: Some say the gyro system smoothes out the ride substantially enough to reduce fuel burn. Here’s what we found: For one prolonged segment with the Seakeeper off, we ran around 35 knots at 3200 rpm and saw a fuel burn right around 56 gallons per hour. Then we turned it back on and watched the numbers. We ran at 34 knots and 3100 rpm and the burn was 51.5 gph. As you can tell, this is by no means a conclusive, scientific test, merely some observations. Here are some more observations. 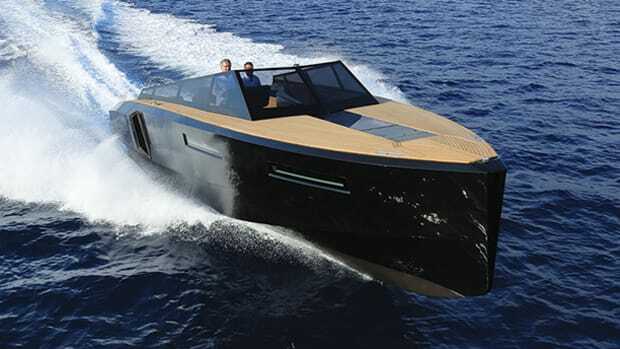 MJM will not just add a flying bridge to an existing design, that much is clear. And with a Marine Air Systems air-conditioned helm deck under cover of a hardtop and enclosed with enormous crystal-clear Strataglass curtains that roll out of the way on nice days (I’m curious to see how they hold up in the relentless UV exposure and salt), you can get the flying-bridge feel at this helm station, surrounded by your guests. 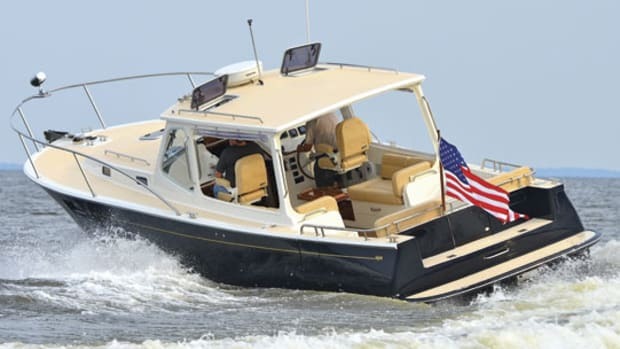 The cockpit can be shaded by an optional bimini that folds aft and stows above the transom, but I don’t think I’d even want it, to be truthful: The hardtop covers enough deck space. The Sealift hydraulic swim platform simplifies water access and will launch and retrieve a tender weighing up to 2,500 pounds. Lockers beneath the bridgedeck side seating open to gaping stowage areas, with fuel tanks outboard and accessible. 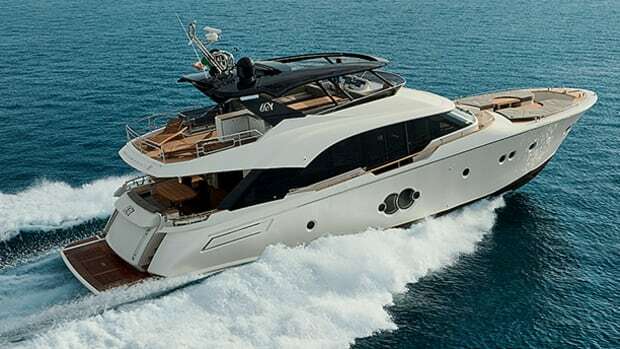 If you’re a cruising couple with occasional guests, the single stateroom forward will be all you need (there’s a second stateroom option available but you give up the saloon dinette and the open deckplan below). The galley and saloon area is pleasant, with a dinette that converts to a guest berth with hilo table. A gently curving overhead and polished steel vertical pole for a handhold at the companionway give it a real sailboat feel. That’s one thing about the MJM interior spaces—you know you’re on a boat. That chair is an excellent summation of the whole design brief—it’s what one man thinks will work for him, and he happens to think you may see it his way. And when that man has the boatbuilding chops that Johnstone has, he may be right. 265 gal. fuel, 130 gal. water, 2 persons, 200 lb. gear.